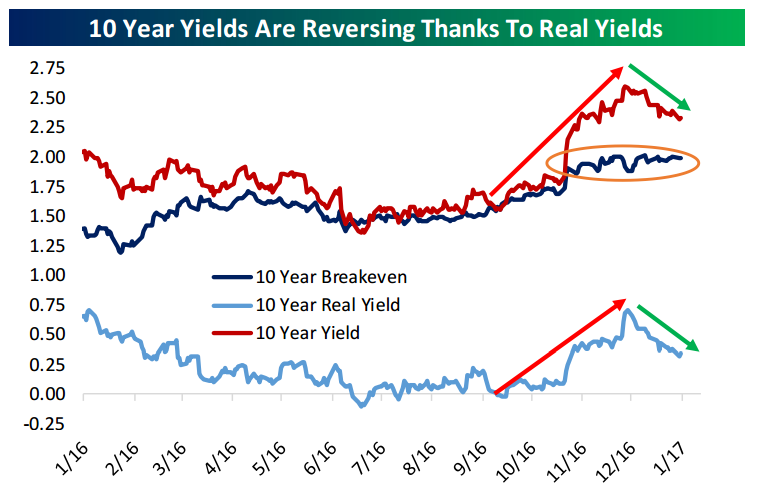 In this week’s note, we look at the driving factor in Treasury yields since they peaked in December, as well as that influence’s (low) predictive value for the economy. Click here to start your no-obligation free Bespoke research trial now! After a post-election surge in December, homebuilder confidence pulled back more than expected to kick off the year. While economists were forecasting the NAHB homebuilder sentiment survey to come in at a level of 69 this month, the actual reading came in two points lower at 67, and down three points from December’s originally reported reading of 70. We would note that last month’s initial reading was also revised down one point, so the m/m decline was just two points. 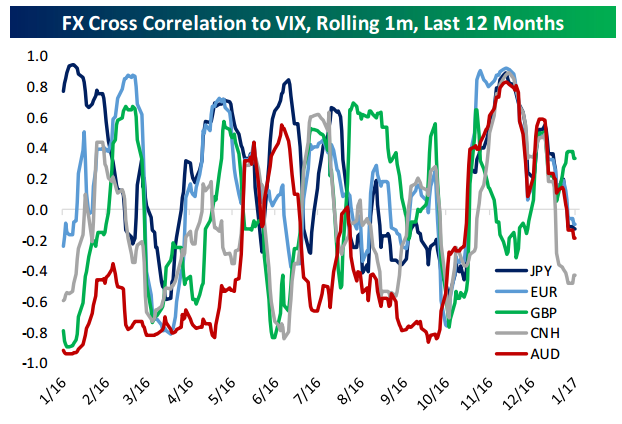 Looking at the chart below, even after this month’s decline, sentiment remains above every other reading of this expansion prior to December. The table to the right shows the breakdown of this month’s report by traffic as well as present and future sales along with sentiment broken down by region. 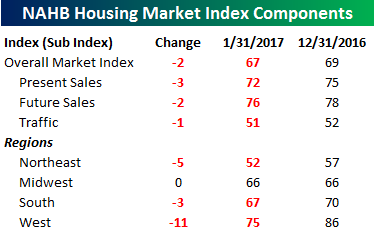 Every component of the overall index declined in January, with the biggest decline coming in Present Sales while Traffic saw the smallest decline. 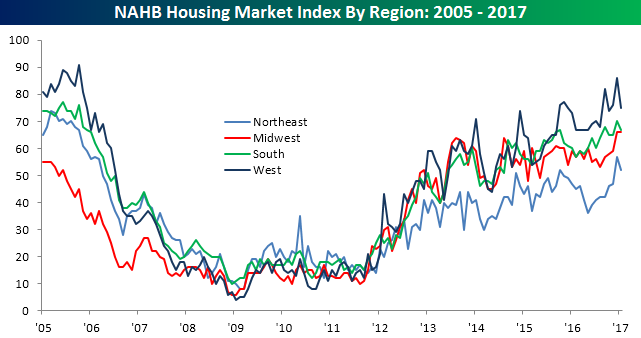 In terms of regions, sentiment on the coasts saw the largest decline, while homebuilder sentiment in the Midwest, which includes the rust belt states that went in favor of Trump, was unchanged at its highs for the cycle. Even for the other three regions, though, it is important to remember that January’s decline in sentiment comes from what were the highest levels of the cycle. 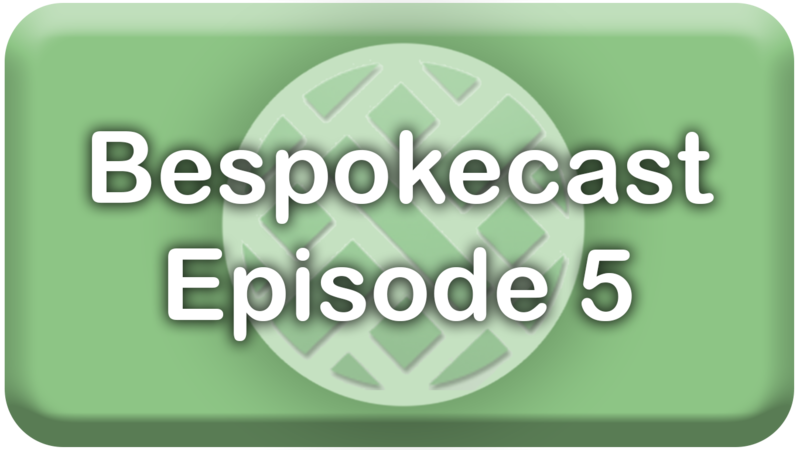 We’re happy to announce that the newest episode of Bespokecast is now available to the general public both here and via the various podcast platforms. Be sure to subscribe to Bespokecast on your preferred podcast app of choice to gain access to our full collection of episodes. We’d also love for you to provide a review as well! 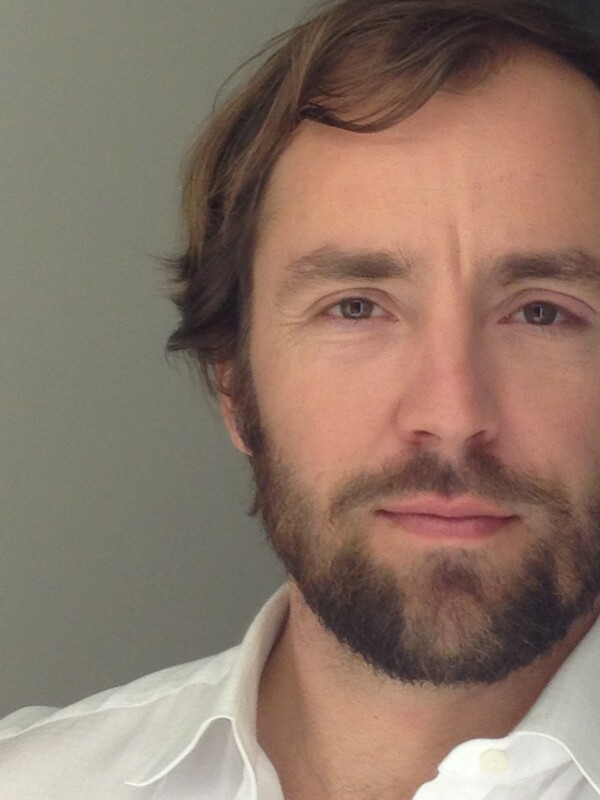 In our newest conversation on Bespokecast, we speak with investor, blogger, analyst, and commentator Meb Faber. Meb is the CIO of Cambria Investments, has written three books on investing as well as 10 white papers and countless blog posts. You can follow his work at MebFaber.com. Cambria’s ETFs cover a broad swathe of US and global equity markets as well as asset allocation and fixed income. For Meb and Cambria, evidence-based investing is at the core of their investment approach, and we spend much of the podcast discussing the specific investment strategies this leads to. We were thrilled to record this conversation and are very excited with how it turned out. We hope you feel the same! Each new episode of our podcast features a special guest to talk markets with, and Bespoke subscribers receive special access before it’s made available to the general public. If you’d like to try out a Bespoke subscription in order to gain access to these podcasts in advance, you can start a two-week free trial to check out our product. To listen to episode 5 or subscribe to the podcast via iTunes, GooglePlay, OvercastFM, or Stitcher, please click below. Looking for deeper insight on global markets and economics? In tonight’s Closer sent to Bespoke Institutional clients, we take a look at US equities and the dollar, as well as charting out the latest readings on credit availability and demand courtesy of the ECB’s Bank Lending Survey. The Closer is one of our most popular reports, and you can see it and everything else Bespoke publishes by starting a no-obligation 14-day free trial to our research! 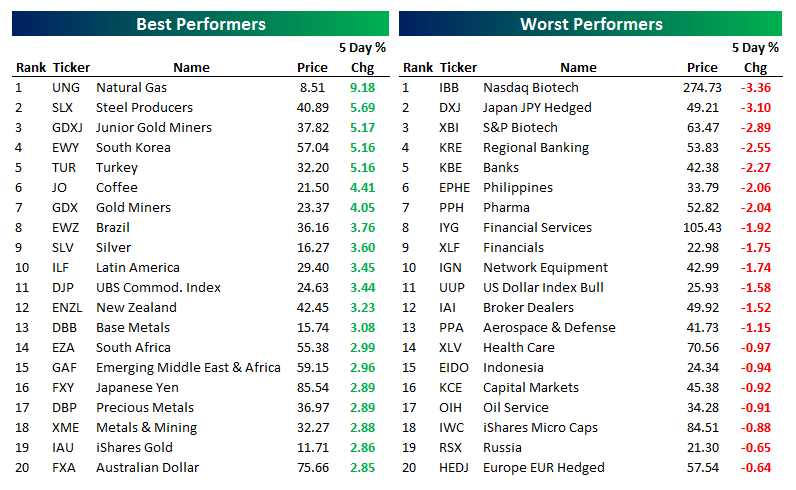 Natural gas, steel, and gold miners have been the best performers of the past week with highly volatile Turkey also delivering a strong performance. South Korea was the best-performing country ETF over the last five sessions while LatAm and industrial metals have been strong too. Biotech, banks, pharma, and financials have underperformed in the past week as the markets continue to evaluate the policy platform of the incoming President. Bespoke provides Bespoke Premium and Bespoke Institutional members with a daily ETF Trends report that highlights proprietary trend and timing scores for more than 200 widely followed ETFs across all asset classes. If you’re an ETF investor, this daily report is perfect. Sign up below to access today’s ETF Trends report. See Bespoke’s full daily ETF Trends report by starting a no-obligation free trial to our premium research. Click here to sign up with just your name and email address.